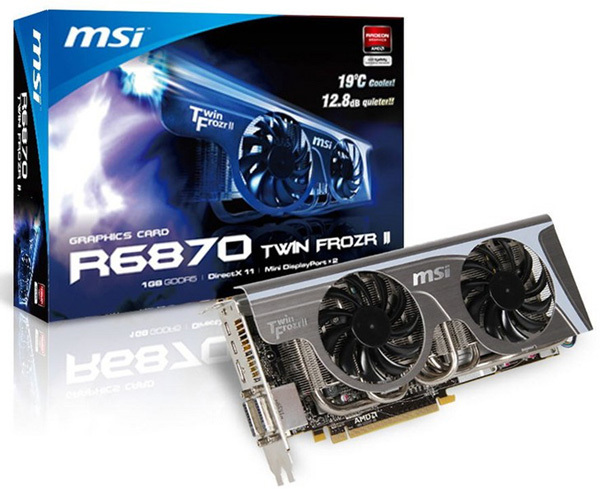 MSI intros today the R6870 Twin Frozr II graphics card which under full load is 19C cooler and 12.8dB quieter than reference design models. The new graphics card utilizes the latest 40nm AMD Radeon HD6870 GPU, has 1GB of GDDR5 VRAM with 256-bit memory interface and is made with all Solid CAPs. Equipped with Twin Frozr II thermal solution, which consist of a large-area copper base heat-sink, two 8cm temperature-controlled PWM fans dual 8cm temperature-controlled PWM fans. The card is also equipped with dual-DVI, dual mini DisplayPort and HDMI 1.4a which support 3D video and 7.1-channel TrueHD and DTS-HD audio formats.